I am all about books that actually help you….and trust me, this book will! If you struggle a lot with trying to figure out your day to day events, or you miss appointments a lot…this book will help you to get organized, just by using your email program….and it’s all FREE! From business mail, ways to save time, and utilizing the apps and free programs that you can add right to your home page…all designed to help you save time. The first thing I did is glance over the book to see what all it could do to help me. As I then got into the book more, I discovered that Google has a ton of apps that are designed to help you save time….I love the apps that they have, being able to choose the items I need for me and my business. I also loved the exact ideas they had, from their tasks down to your inbox priorities. The book also comes with a chapter if you have technology that is more on the go… I do not right now, not sure if I want that capability, however, it will allow me the opportunity to be able to be at work, and need to check out my list of things I need to buy at the store, so on my way home…I can pick it up! Or, allows me to work on my task list as I can, instead of blindly going around and getting things done. 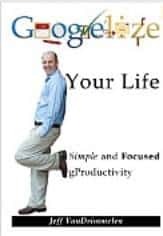 This is an excellent book, one I would recommend to everyone, especially if you are struggling with time management. Thanks for the review Stacie. I’m so glad you enjoyed it! Please let me know if you have any questions I can help with.